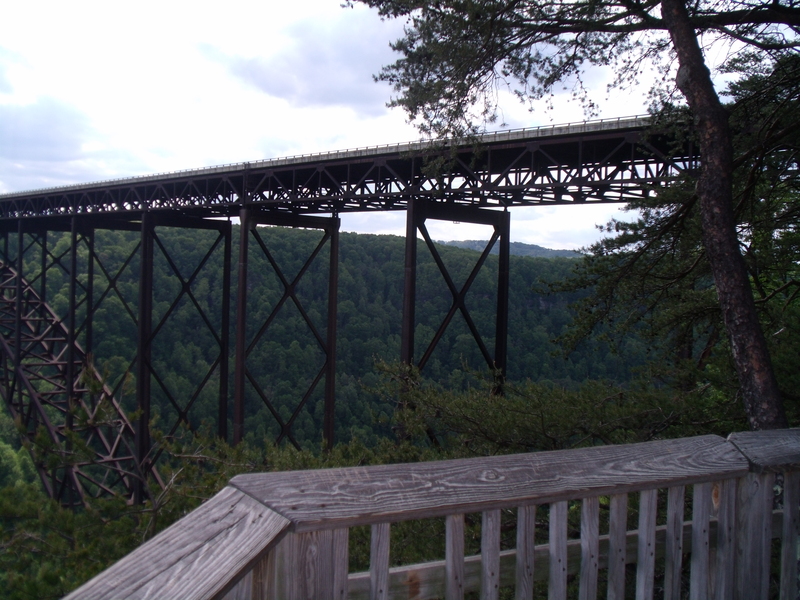 In my second novel a character visits the New River Gorge Bridge, playing “tourist” in WV. I drive over that bridge every time I travel between my home in NC and the family farm. I generally don’t give it a whole lot of thought other than to admire the spectacular view, but on the last trip I stopped at the visitor’s center to make sure I had my details right. This was a mistake . While it was helpful in terms of making sure my setting was accurate, the trip down the 278 steps to the viewing platform was regrettable. Not only could I look up at the world’s second longest single span expansion bridge, I could also look DOWN into the gorge. Way, way down. And I could see just how high the bridge is. Not to mention how preposterous it is that the thing stays in the air. I mean, it’s HUGE. And there’s nothing under it but air. Did I mention I have an issue with heights? And that I still had to drive across that behemoth on my way home? Egads. Just so you know, it takes two verses of Amazing Grace to get across. And even while singing really, really loud, my brain can still picture how far down it is. Oy. My tummy hurts. My husband is just going to have to do the driving next time. The bridge is open to pedestrians one day a year on Bridge Day–October 19 this year. On Bridge Day people rapel from the bridge and base jump. They sign up way in advance and vie for the chance to do this. Seriously. The bridge is 3,030 feet long, 876 feet high, 70 feet wide, and weighs 88 million pounds. Did you get that last one? Held up by a single arch. The Washington Monument would fit under the bridge with 325 feet to spare. Throughout the year there are Bridge Walk tours offered. They guide you on a stroll of the full length of the catwalk under the bridge. People pay to do this. When the bridge was opened in 1977 it cut the trip across the gorge from 45 minutes to 25 seconds. Somehow it seemed to take longer . . . If you want to learn more about Bridge Day or the bridge itself, click here. I recommend a visit. So long as you don’t have irrational heights/bridges issues. Yet another reason we are separated at birth!! 2 verses of Amazing Grace?? Honey, I would have gunned it and made it by 1 verse!! If only the old Cooper River Bridge in Charleston, SC. Were still there. You would LOVE that one. Yuh huh. SURE. Only if there’s an antique auction at the other end!! Yup, my hubby works really close to here. BTW–did you know in the earlier days, before that bridge was built, people had to travel waaaaaaaaaaaay around to get to the next county–no shortcuts? It was like living in two different states, apparently. There’s a narrow walkway under the bridge you can hook a line to and walk the distance across…I keep thinking I might do that for my big 4-0. I want to do something crazy, and that would definitely qualify. One of my characters gets dragged out to do the Bridge Walk by some of her friends. That’s as close as I’ll EVER come to doing it! If I did it, I’d never be cruel enough to make one of my characters go through it. I mean, authors are supposed to put their characters through the wringer, but I can only go SO far. I can barely remember the trip south before the bridge, but it had some interesting places to see. Of course it also had a LOT of motion sickness too! I think you can still drive down and use the “little” bridge. Where can I sign up for base jumping! It’s a funny thing about heights. I used to do a lot of man aloft work, and came out under helicopters on strings (quick way to get out of nasty places with people shooting at you), and was never bothered. It’s like my frame of reference rotates 90 degrees, and instead of looking ‘down’ I’m looking ‘across’. I’ve no idea whether this can be taught. On the other hand, claustrophobia is a problem. I recently had an once-in-a-lifetime opportunity to enter an unexplored cave system. had to pass, and give my spot to my wife. I regretted missing it, but would make the same decision again. Caves? Not in my lifetime will I enter a cave. A grotto? Yes. Cave? Why don’t we just put a bridge IN the cave and call it heart failure? There are some pit caves in Mexico which could use bridges…but they only have rope walkways. I did go into Carlsbad Caverns, but that’s really more like a mall. With bats. A mall with bats? You really do want me to hurl all over this nice blog, don’t you? Mr ‘I Jumped From Helicopters’??? Here’s a deal, me and Sarah will drive over that bridge if you get a proper haircut and …AND…wear a tux. HA! Shaking already, aren’t we?? Already got the haircut. I look less like Wolfman and more like Kevin. I can do a Tux. Have worn one, actually, with a kevlar cummerbund, but that is another story which I will not tell. You know, I don’t even blink anymore…kevlar cummerbund? I can actually do a helicopter better than an airplane. In a helicopter it feels like you could be back on the ground without much trouble. I think that’s my thing. It’s not that I hate heights, it’s that I LOVE the ground. As for base jumping, go to the Bridge Day website and sign up! I’ll come watch. From the ground.